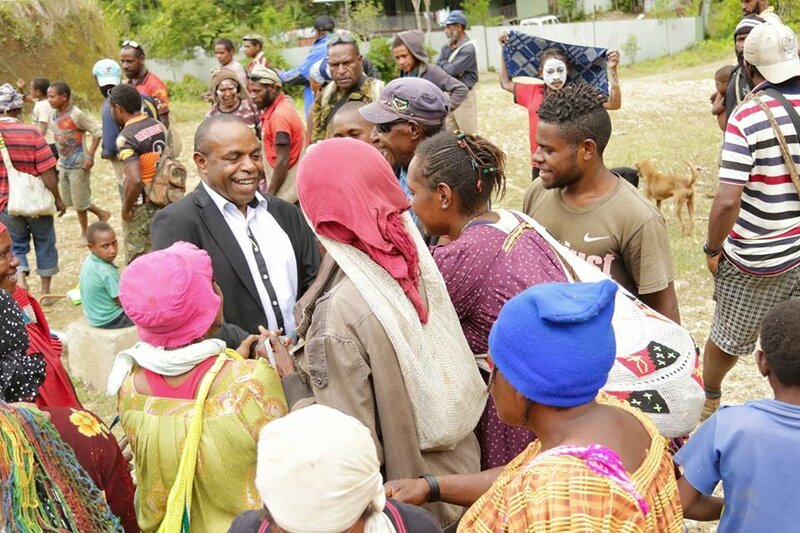 The communities of Yalanda and Homa in the PNG Highlands are looking toward rebuilding their lives after the devastating 7.5 magnitude earthquake February 26. 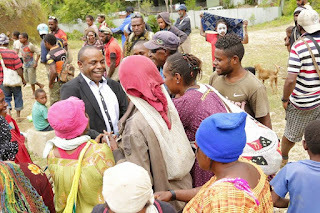 Moran Special Purpose Authority Chairman Anthony Hamaka accompanied by Kutubu Local Level Government President John Pipi Kila visited the worst hit village of Yalanda this week. An emotional Mr Hamaka broke down as he saw the suffering his people were going through. “I am very sad to see you all living like this, before the earthquake we never lived like this. We were a strong and united community,” Mr Hamaka said. Mr Hamaka announced the payment of K500, 000 to a local contractor company to immediately start on restoring the vital road network which has been a life line for the communities of Kekero, Yalanda, Baguale, Paua and Homa. “I have brought a cheque K250, 000 to engage a local contractor company to commence work on blockages on the road immediately and to have us connected with the main road, so we will be able to access services through our road,” Mr Hamaka said. Mr Hamaka also thanked Oil Search and other parties involved in the relief response after the disaster by providing food, water and temporary shelter for those that were displaced. “I like to thank Oil Search and other stakeholders for the support to my people in their time of great need, without your quick response to our needs, we would be find it very difficult to rebuild,” he added. Kutubu Local Level Government President John Pipi Kila also commended the community for their resilience and thanked major stakeholders like Oil Search and it partners in ensuring that people’s wellbeing and interests were looked at first. “I am here, Oil Search is here and also the other stakeholders, through partnership we to build our lives and our community,” Mr Kila said. The leaders than visited Home Village, which is home village of Mr Hamaka and Mr. Hamaka presented a financial assistance of K50, 000 to the people to help with rebuilding their lives.